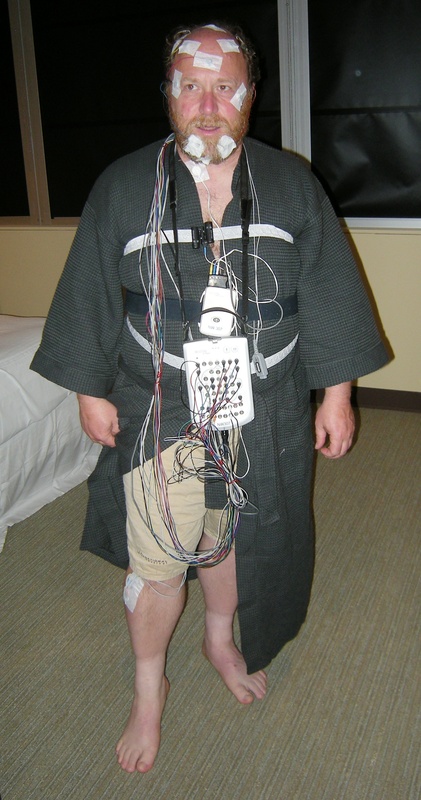 If you have been to more than just one sleep study, you may be the victim of human experimentation by sleep study. If you do not remember much about what I say, remember that a narcoleptic only has to go to one or two sleep studies so that you can demonstrate to doctors and insurance companies that you have Narcolepsy. once proven, unless there are extenuating circumstances about your insurance company which I have seen, you should never have to go to another sleep study again. back in Florida where I grew up, I have been to a number of sleep studies and I could not sleep much. I only slept a little bit with difficulty. So even though I was falling asleep while driving I could not sleep in the sleep lab. I thought this was odd at the time because I could fall asleep anywhere. Now, in the retrospect of being a targeted individual (TI) I now realize that a handler was using electromagnetic energy to deny me the ability to demonstrate to a doctor that I have the typical signs of someone with narcolepsy. The neurologist who was helping me at the time was intuitive enough to verify it by other means. I believe it was interrupted on purpose. Dont researchers sometimes need to get a research subject into a one on one laboratory environment? Also, it could be that a sleep lab is legitimate and it and yet the results it produces are used for nefarious purposes by people who exploit TI’s. Sometimes the researchers need to get direct data rather than via remote wireless telemetry, which most people know about? This is a fact so dont let them fool you in a sleep lab situation. Look at every aspect, because you should know why your doctor is asking to attend a sleep study and it should be obvious that this sleep study, if you attend, will help that condition. Sleep apnea for instance is a valid reason for a sleep study and snoring is a valid concern. But proving it over and over again that you have narcolepsy is cause for concern that you are being used in and for human experimentation. now that I am old, and after all the years I have been taking medicine to help me stay awake and healthy. Yes, for a narcoleptic, speed keeps you healthy and wards off depression. i am directed to attend a sleep study by doctors and the reason they give, is so they can prove to the DEA that i am really serious about my narcolepsy. Believe me when I tell you that the last thing you need to do is prove anything to the DEA. If your doctor provides or has provided you with amphetamine pills or other, that allow you to sleep more normally, be aware of this. The really is that If you have a disease called narcolepsy which has already ruined your life, then you know that you have narcolepsy. If you have researched it, then you can compare the narcolepsy symptoms to your situation and you will know, if you really have narcolepsy. So if you find that your doctor is asking you to prove it again and again, then you may be a victim abuse and human experimentation. If you can not stay awake during the good times of life and now a doctor is worried that you might be enjoying the medication which allows you to sleep normally and has saved your life? You may say, they must be joking. You paid for the right to have these pills with your blood, sweat and tears and you have a right to have them and you need not suffer the fools in DHS and FBI nor should you take the infrA-SSholes innuendos seriously. They can question all they want and if they ask about it you can just laugh in their face rather than answer their question. Dont they know and realize that all drug laws are Americas problem with drugs. it is the scarcity that creates the real problem with drugs or anything else which can be sold discretely. The jails and prisons are full of the guilty, of victim-Less crimes. The drug problem is a controls issue for the elite and the elite are the ones in charge at the time. It is to take the people who think they can do what they want and who think they are free and put them in prison to demonstrate to others that they are in reality, SLAVES to the elite. In other words it is to scare you so that you fear authority, which can sweep you off your feet and into prison at the drop of a hat. If you want to be really free, then you have to know that. You will never be free until you stop being a slave to the elites. You may be a slave if you dont know that you are a slave. I went to Medford at the request of a doctor who was giving me a scripts for amphetamine pills so i could live a normal life. It seemed like a small price for my peace of mind given to me by getting my medications on time and without people asking me questions about what it is like when i dont get my medications. Actually I am not addicted to that and it is the same as getting my blood pressure medication on time. But you know, It is always the infra-sshole types that know better. Its good though that the morons are identified and made known to others, so that we will be able to pick them up after this holocaust is over. In fact these people would not act any different if you were dying. After all they are taking money to predate people. These morons are having their brains scraped and slid into the top of their heads as though their skull is opened to allow getting oatmeal scraped into their head/breakfast bowls. The infragard types are stupid useless donkeys who are in fact weaponized morons. They will continually do what they do for the wrong reasons. Learn about it. continuing thought, I had a sleep study in January 2016 and May 2016. I showed up ready to sleep study and got all hooked up with the wires and the technician assured me that he or she would be there for me. They would be there all night watching diligently for any problem or anomaly to occur. They would be out in a jiffy if you had a problem and fix that problem. So off you go to bed, being sure not to pull the wires and get them tucked into a section of the bed by themselves. You try to sleep now. If you have narcolepsy, good luck. I suppose most of the people who do sleep studies, actually do go to sleep. I also suppose that most of the sleep study labs, which host people for sleep studies actually are doing it to help the people who have sleep disorders. There are many neurologists and sleep study labs though, who are actually predatory. That is, they are working for someone who convinced them that using people for brain or whatever research is okay because dont we need to do research and isnt brain research one type of research that would never happen without using humans rather than lab animals in conjunction with research. if they do use humans in research, then they have also bought into the concept that TRAUMA is also necessary in brain research. Think about that until it sinks in. Brain research would not be possible without the ability to induce trauma and watch the pain signal pathways leading to and within the brain. Think of trying to figure out how a machine works if it had a huge bundle of cables going into a black box. It works much better if you can test each wire individually, to see what it does, isnt that so. It is the same with the brain since there are millions of nerve pathways and billions of neurons. So some of the sleep labs are full fledged trauma and torture centers, under the pretense of sleep study labs. Think of this and make sure you understand the concept before continuing. Im sure there are dual purpose sleep labs where people really do get helped. Also, the technicians are Trauma and Torture technicians and maybe they are dual purpose technicians and they can also be therapeutic too. I say this because of the conclusions I reached after having my eyes opened to the concept of sleep studies I had at the in Medford, OR. I did not fall asleep all night. I was traumatized regularly and methodically all night, specifically so that it was impossible to fall asleep while I was being tortured. All the while my brain was being studies to see the pathways leading to the brain from traumatized sites. I have come to this conclusion due to the fact that I was there to study and prove to those doctors in authority that I really have narcolepsy and I am there to demonstrate to the doctors that I can go to sleep on queue as they watch me closely with a jaundiced eye. I am there to demonstrate that I am a good slave and I even feel guilty when it does not go as planned. This is so that I will keep on showing up for those follow up sleep studies, especially now that I am old and it is most difficult to accomplish. But I really know that once diagnosed, I stay diagnosed unless there is a reason adjust medication up or down for some reason. A doctor once convinced that I have difficulty with narcolepsy will continue to give the medication even if he or she thinks that I may in addition to the therapeutic value, think I may in fact like it a little. When in fact it doesnt make one little difference what I think as long as my sleeping problem is taken care of. If you or anyone is having a problem with sleep, I hope you will write down your issue along with some of what I said about the predatory doctors and predatory sleep labs. It may be that your doctor wants evidence that you really have a sleep problem. But when they send you to a sleep study and you do not fall asleep because you are being tortured all night, or because of what seemed like electronic impulses, especially if you go back for a second time, then you may have a predatory doctor and a predatory sleep lab. It is also called a “trauma under the pretense of sleep study”. These people are studying your brain because you surely are not sleeping and they dont even care or mention that you are not sleeping. In fact they think you are so stupid that you will keep coming back again and again because your doctor needs just a little more proof of your disability. Actually, your doctor may be getting paid big money to have you show up at those sleep/BRAIN study torture/trauma labs. Notice that a doctor or anyone can be identified as an abuser if it is obvious to you that they are enjoying their power over you. I dont think there is any difference between getting my amphetamine pills on time for my narcolepsy disability then there is for getting my hypertension pills on time. I am to be dignified as a human being even if you dont respect that. This sleep study business has turned into a sleep/trauma/torture business. It is there to get the patient into a lab situation where they can be used in human experimentation as a victim in a laboratory environment.